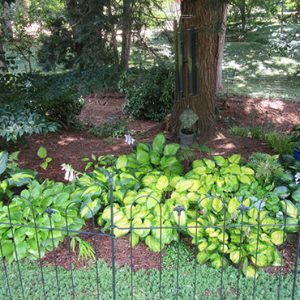 Tended by the same gardener for nearly 30 years, this garden exhibits a sense of history mixed with openness to change. 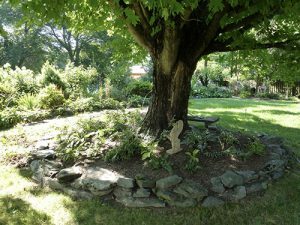 History derives from the venerable sugar maple tree shading native ferns and hostas. 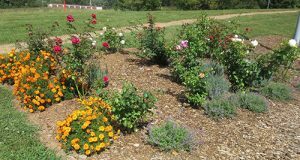 Evolution is evidenced in the new creations of the pollinator garden and the lavender bed. 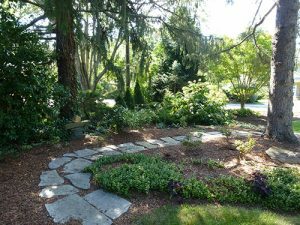 Throughout the property there are many “Perennial Plants of the Year” plants and benches that invite a moment of rest and reflection. 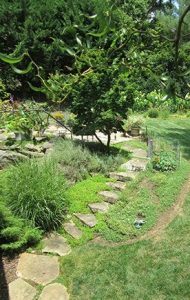 Created in 2016 by Extension Master GardenerSM volunteers, The Learning Garden (TLG) now includes five beds and a compost demonstration site. 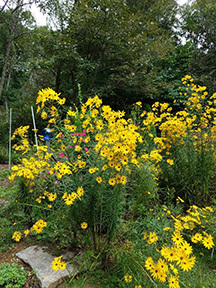 Plants were selected for Buncombe County growing conditions. 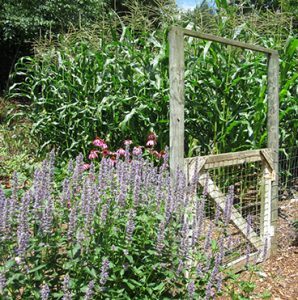 TLG has several microclimates to reflect the variety of gardening environments throughout the county. During the summer months, TLG learning programs will be offered to the public. 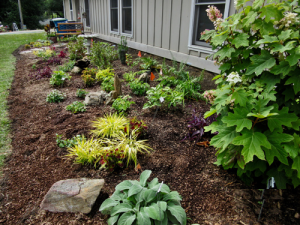 Developed on the principle of planting solutions that are resilient, ecologically functional, and beautiful, this garden shows a variety of plants arranged to provide structure, interest, and soil stabilization. Resilience was demonstrated when removal of bamboo exposed a bog area which was then used to create the right place for plants that like wet feet. A recently added setting is the densely shaded woodland path. 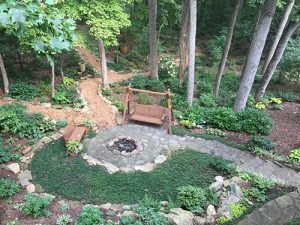 Inspired by a childhood memory, this garden holds much sentiment because many of the plants have been given by family members and friends. 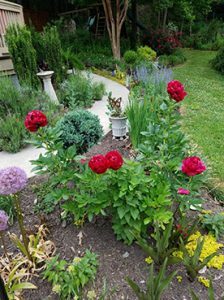 Plantings have been selected to display year-round interest and maintained without pesticides to nurture pollinating insects, birds, and other wildlife. 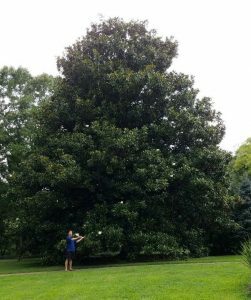 The giant Southern Magnolia has been designated as an Asheville Treasured Tree by Asheville Greenworks. 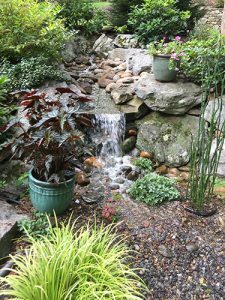 The need to remedy a drainage problem created the opportunity to build a recirculating waterfall. An abundance of rocks provided the material to construct paths in the woods. 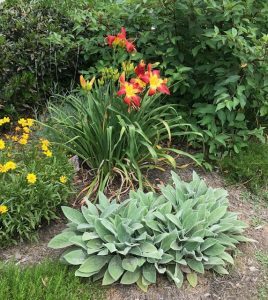 150 plants were brought from a previous home, but hostas and hellebores are grown on site from seed. 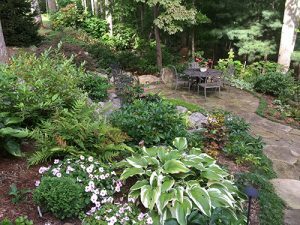 More than 60 named hostas and over 300 helebores grace the garden. 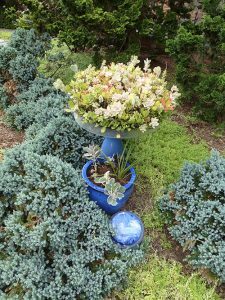 Some are planted in pots in the soil to ward off damaging vole activity.